SquashSmarts, Inc. is a 501c3 nonprofit organization. Contributions are tax deductible in accordance with the laws governing non-profits. 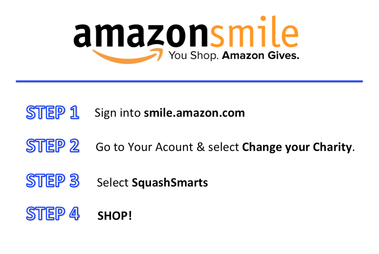 For more information on how you can support SquashSmarts, please review the "Ways To Give" below or contact our staff by e-mail or phone at 215.221.6860. Thank you for your support of our students! Please make checks payable to “SquashSmarts”. SquashSmarts uses Network for Good’s secure site to accept your donations. You can make a single donation or a recurring monthly, quarterly or annual donation. Click here. SquashSmarts is a member of the United Way of Greater Philadelphia and Southern New Jersey and welcomes workplace giving through the United Way. Our Donor Choice number is 14586. SquashSmarts is a member of the Combined Federal Campaign for Southeastern Pennsylvania and Lehigh Valley Area. Federal Government employees may make their workplace donations through the Combined Federal Campaign. SquashSmarts welcomes your matching gift. If you work for a company that matches gifts to charities, your contribution to SquashSmarts may be doubled. We will give you full credit for both gifts. Contact your Human Resources department for guidelines on how to increase the value of your gift to SquashSmarts by having your company match it. Contact us for any information you may need to complete your company’s matching gift forms. SquashSmarts holds several events throughout the year to benefit our students. If you or your company would like information on how to be a sponsor for an event, please click here. SquashSmarts welcomes grants and foundation gifts at varying levels. If you are interested in making a donation through your foundation, please contact us and we can help you decide the best way for your organization to support our students. SquashSmarts has several naming opportunities and student sponsorships that will leave a lasting impression for you or your organization. To see your options, please click here. SquashSmarts will happily accept your new or gently used items. We especially need, books, school supplies, paper, athletic clothing, squash racquets, squash shoes, squash goggles and squash balls. To start the process, please click here. To get guidance on how to start a drive at your office or school, please contact us or fill out the form.